Duck aficionados, prepare your stomachs because TungLok Group is jazzing up the food scene once again with their new restaurant, Duckland. Priding themselves on using ducks from Silver Hill Farm in Ireland—a breed that is known to be the ‘wagyu’ of ducks—the Irish duck is no normal duck. It is actually a unique and cultivated hybrid of the Peking duck and the Aylesbury duck, which are poultry specially bred for their dense and porous skin. This means that the ducks used in the dishes here at Duckland will be even more succulent, tender and robust than your average duck. Adopting a ‘farm to fork’ concept which emphasises heavily on the utilisation of top-notch quality ducks from Ireland, their dishes all embody the authentic flavours of Ireland and the best flavours of duck meat you can get. Located in United Square at Novena, Duckland has just opened its doors in mid-January. From now until 28th February 2019, our readers can quote ‘ladyironchef’ to enjoy 10% off the total bill with a minimum spend of S$50*. Here is what you can expect at Duckland! Duckland serves up a pretty impressive range of both Asian and Western-style duck dishes that will raise the bar for duck lovers anywhere else. However, they aren’t just all about ducks. There are other comforting options such as lamb stews and even a whiskey cake that we are totally digging! Starting off with their signature dish, the Roast Irish Duck (S$28 for half, S$50 for whole) is definitely the one item you have to order because going to Duckland and not ordering this dish is like going to McDonald’s and not eating fries. The duck is roasted in a combi-oven, which results in gorgeously amber crisp skin as well as delightfully tender and moist meat. This duck is the very definition of melt-in-your-mouth; the perfect ratio of flesh to fat allows the duck to maintain its soft succulence, and when paired together with that aromatic skin, you’ll experience a burst of complex umami flavours of epic proportions. Each serving of their glorious Roast Irish Duck comes with a selection of dipping sauces which include raspberry sauce, calamansi chilli as well as yellow mustard. However, in all honesty, we feel that the natural flavours of the duck are so outstanding by itself that the sauces are unnecessary. Boy, this Duck Confit & Waffle (S$20) has got to be the best rendition in Singapore. To begin with, not many places serve Duck Confit & Waffle, but we now have a place to go to when we need a “ducking good” respite. Encrusted in a smoky, crisp skin that brims with intense flavours of duck fat, the duck leg was fork-tender with a pleasant bite to it. Executed brilliantly, we adore how Duckland did not incorporate any fancy twists to the dish but instead, brought out the best qualities of the meat through their cooking methods. 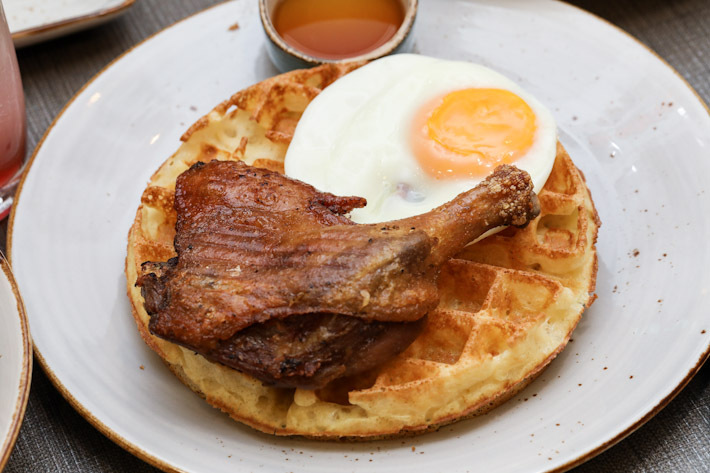 Drizzle over the buttery sweet maple syrup at the side to bind the flavours and textures of the waffle, egg and duck leg all together! The restaurant’s Duck Fried Rice (S$10) is unlike your typical Chinese-style fried rice. Their rendition of such a simple rice dish consists of pieces of Irish roast duck, sweet corn, zucchini and garlic, making it a flavour bomb that bursts with a complex, intense ‘wok hei’ aroma that cloaks every mouthful you take. What’s worth mentioning is that they enhance the fragrance of their steamed rice with duck fat before stir-frying it, making this dish a notch tastier and aromatic than your average serving of fried rice. On Duckland’s menu, you can find 2 types of duck pies that are perfect for a fuss-free snack or a quick meal on-the-go. The restaurant offers two options, namely the Black Pepper Duck Pie and Tomato-Pineapple Duck Pie (S$6 each). The former comprises succulent duck meat and onions coated in a black pepper sauce while the latter consists of tangy pineapple, tomato and duck meat encased in a savoury baked puff pastry. Loaded with a chock full of hearty, healthy ingredients including carrots, potatoes, celery, a myriad of herbs and spices and a generous helping of lamb cooked to tender perfection, their Irish Lamb Stew (S$22) is a showstopper in its own right despite not being a duck dish. Bacon, colcannon and cabbage is a classic combination commonly found in Irish restaurants. For the uninitiated, colcannon is also known as Irish mashed potatoes and is a traditional Irish dish that incorporates cream, butter and kale into mashed potatoes to give it its creamy texture. Duckland’s Bacon, Cabbage & Colcannon (S$20) sees slices of smoky old-fashioned bacon—essentially Irish bacon which is leaner as opposed to the fattier American bacon we are used to—atop a generous helping of colcannon, accompanied by cabbage and a creamy parsley sauce. What we found slightly bewildering was the fact that Duckland, a place that specialises in duck, has one of the best fish and chips (S$18) that we have ever had in Singapore. Here, fresh barramundi fillets are copiously coated in a thick, fragrant batter and are deep-fried to a lovely golden brown. Cut into it to reveal fresh and flaky barramundi fillets which go hand-in-hand with their house-made Japanese mayo-tartar sauce. Offering a rotating selection of seasonal oysters, Duckland serves these premium shellfishes in accordance to the season, depending on which is the freshest and best during that particular period. Slurp up some of these plump, smooth oysters that are freshly-shucked in the restaurant. Imported from various parts of the world, expect meaty Irish oysters or Fine De Claire oysters from France. Prices vary according to its season. This beautifully put together salad (S$15) provides a lovely, refreshing touch to the restaurants otherwise very rich and savoury menu. 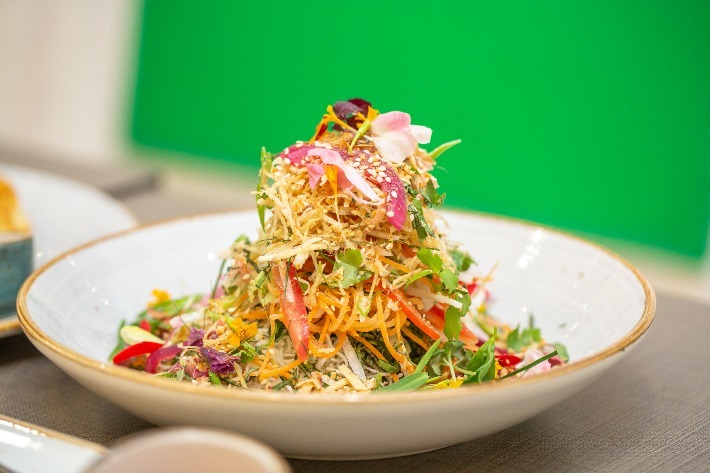 The Singapore Slaw is an original Singapore-style salad that was created by International Celebrity Chef Susur Lee, Featuring a colourful mix of fresh herbs and vegetables such as julienned red carrots, daikon, turnip and edible flowers, they are tossed together in a tangy raspberry dressing that serves to pull the entire salad together. Round off your entire experience at Duckland with a couple of their decadent sweet treats. The Whiskey Cake (S$7) is an indulgent treat that features an aptly dense chocolate cake that comes with a luxurious hint of whiskey. The Apple Crumble (S$7) is also another delight you mustn’t miss. A medley of soft and crunchy textures is encased in a buttery, crunchy tart exterior, presenting fruity bursts of flavours that comes with strong notes of cinnamon. Promotion is valid by presenting quoting ‘Ladyironchef’ by either sharing our Duckland article or video. * Valid at Duckland, United Square Shopping Centre. * Promotion is valid from now till 28 February 2019. Strictly no extension of validity period. * Valid for dine-in only. * Valid for per visit, per bill, per table only. * Not valid in conjunction with other promotion, discounts, privileges/membership cards and/or voucher/eVoucher payment. * The management reserves the right to change the terms and conditions of promotion from time to time without prior notice. * The management’s decision on the terms and conditions shall be final. *10% with a minimum spend of S$50 (before service charge & GST). This post was brought to you by Duckland.